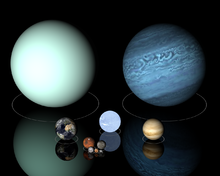 Objects of sizes in different order of magnitude. 10−35 1 Planck length 0.0000000000162 ym Planck length; typical scale of hypothetical loop quantum gravity or size of a hypothetical string and of branes; according to string theory lengths smaller than this do not make any physical sense. Quantum foam is thought to exist at this level. Upper bound of the typical size range for "fundamental strings"
280 pm Average size of the water molecule; actual lengths may vary. during a time interval of 1/299 792 458 of a second. See History of the metre for previous definitions. 2.72 m Height of Robert Wadlow, tallest known human being. 52 m Height of the Niagara Falls. 974.6 km Greatest diameter of the dwarf planet Ceres. 1027 1000 Ym 1200 Ym Lower bound of the (possibly infinite) radius of the universe, if it is a 3-sphere, according to one estimate using the WMAP data at 95% confidence It equivalently implies that there are at minimum 21 particle horizon-sized volumes in the universe. Ym According to the laws of probability, the distance one must travel until one encounters a volume of space identical to our observable universe with conditions identical to our own. To help compare different orders of magnitude, this section lists lengths shorter than 10−23 m (10 ym). 1.6 × 10−11 yoctometres (1.6 × 10−35 metres) – the Planck length (Measures of distance shorter than this are considered nonsensical and do not make any physical sense, according to current theories of physics). 1 ym – length of a neutrino. To help compare different orders of magnitude, this section lists lengths between 10−23 metres and 10−22 metres (10 ym and 100 ym). To help compare different orders of magnitude, this section lists lengths between 10−22 m and 10−21 m (100 ym and 1 zm). To help compare different orders of magnitude, this section lists lengths between 10−21 m and 10−20 m (1 zm and 10 zm). 2 zm – length of a preon, hypothetical particles proposed as subcomponents of quarks and leptons; the upper bound for the width of a cosmic string in string theory. To help compare different orders of magnitude, this section lists lengths between 10−20 m and 10−19 m (10 zm and 100 zm). To help compare different orders of magnitude, this section lists lengths between 10−19 m and 10−18 m (100 zm and 1 am). To help compare different orders of magnitude, this section lists lengths between 10−18 m and 10−17 m (1 am and 10 am). 1 am – upper bound of the typical size range for "fundamental strings"
To help compare different orders of magnitude, this section lists lengths between 10−17 m and 10−16 m (10 am and 100 am). To help compare different orders of magnitude, this section lists lengths between 10−16 m and 10−15 m (100 am and 1 fm). The femtometre (symbol fm) is a unit of length in the metric system, equal to 10−15 metres. In particle physics, this unit is more commonly called a fermi, also with abbreviation "fm". To help compare different orders of magnitude, this section lists lengths between 10−15 metres and 10−14 metres (1 femtometre and 10 fm). To help compare different orders of magnitude, this section lists lengths between 10−14 m and 10−13 m (10 fm and 100 fm). To help compare different orders of magnitude, this section lists lengths between 10−13 m and 10−12 m (100 fm and 1 pm). To help compare different orders of magnitude this section lists lengths between 10−12 and 10−11 m (1 pm and 10 pm). To help compare different orders of magnitude this section lists lengths between 10−11 and 10−10 m (10 pm and 100 pm). To help compare different orders of magnitude this section lists lengths between 10−10 and 10−9 m (100 pm and 1 nm). To help compare different orders of magnitude this section lists lengths between 10−9 and 10−8 m (1 nm and 10 nm). To help compare different orders of magnitude this section lists lengths between 10−8 and 10−7 m (10 nm and 100 nm). Comparison of sizes of semiconductor manufacturing process nodes with some microscopic objects and visible light wavelengths. At this scale, the width of a human hair is about 10 times that of the image. To help compare different orders of magnitude, this section lists lengths between 10−7 and 10−6 m (100 nm and 1 μm). 100 nm – 90% of particles in wood smoke are smaller than this. The silk for a spider's web is around 5–7μm wide. To help compare different orders of magnitude, this section lists some items with lengths between 10−6 and 10−5 m (between 1 and 10 micrometres, or μm). To help compare different orders of magnitude, this section lists lengths between 10−5 m and 10−4 m (10 μm and 100 μm). 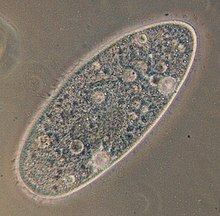 A paramecium is around 300 μm long. To help compare different orders of magnitude, this section lists lengths between 10−4 m and 10−3 m (100 μm and 1 mm). The term myriometre (abbr. mom, equivalent to 100 micrometres; frequently confused with the myriametre, 10 kilometres) is deprecated; the decimal metric prefix myrio- is obsolete and was not included among the prefixes when the International System of Units was introduced in 1960. "1mm" redirects here. For the Perfume song, see Level3 (Perfume album). For the measure, see millimetre. To help compare different orders of magnitude, this section lists lengths between 10−3 m and 10−2 m (1 mm and 1 cm). To help compare different orders of magnitude, this section lists lengths between 10−2 m and 10−1 m (1 cm and 1 dm). "10cm" redirects here. For the band, see 10cm (band). An adult human foot is about 28 centimetres long. To help compare different orders of magnitude, this section lists lengths between 10 centimetres and 100 centimetres (10−1 metre and 1 metre). "1m" redirects here. For other uses, see 1M. To help compare different orders of magnitude, this section lists lengths between one metre and ten metres. Light travels 1 metre in ​1⁄299,792,458, or 3.3356409519815E-9 of a second. 1.435 m – standard gauge of railway track used by about 60% of railways in the world = 4' 8½"
4.1 m – diameter of 2008 TC3, a small asteroid that flew into the Earth's atmosphere on October 7, 2008. To help compare different orders of magnitude, this section lists lengths between 10 metres and 100 metres. 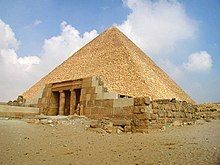 The Great Pyramid of Giza is 138.8 metres high. To compare different orders of magnitude this section lists lengths between 100 metres and 1000 metres (1 kilometre). To help compare different orders of magnitude, this section lists lengths between 1 kilometre and 10 kilometres (103 and 104 metres). 98 airports have paved runways from 4 km to 5.5 km in length. Most of Manhattan is from 3 to 4 km wide. To help compare different orders of magnitude, this section lists lengths between 10 and 100 kilometres (104 to 105 metres). The myriametre (sometimes also spelled myriameter, myriometre and myriometer) (10,000 metres) is a deprecated unit name; the decimal metric prefix myria- (sometimes also written as myrio-) is obsolete and not included among the prefixes when the International System of Units was introduced in 1960. Distance marker on the Rhine: 36 (XXXVI) myriametres from Basel. The stated distance is 360 km; comma is the decimal separator in Germany. 1 mil, the unit of measure commonly used in Norway and Sweden used to be 11,295 m in Norway and 10,688 m in Sweden. A length of 100 kilometres (about 62 miles), as a rough amount, is relatively common in measurements on Earth and for some astronomical objects. It is the altitude at which the FAI defines spaceflight to begin. To help compare orders of magnitude, this section lists lengths between 100 and 1,000 kilometres (105 and 106 metres). A distance of 100 kilometres is equal to about 62 miles (or 62.13711922 miles). Small planets, the Moon and dwarf planets in our solar system have diameters from one to ten million metres. 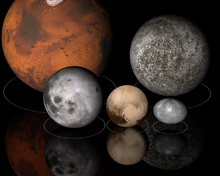 Top row: Mars (left), Mercury (right); bottom row: Moon (left), Pluto (center), and Haumea (right), to scale. To help compare different orders of magnitude, this section lists lengths starting at 106 m (1 Mm or 1,000 km). To help compare different orders of magnitude, this section lists lengths starting at 107 metres (10 megametres or 10,000 kilometres). To help compare different orders of magnitude, this section lists lengths starting at 108 metres (100 megametres or 100,000 kilometres or 62,150 miles). 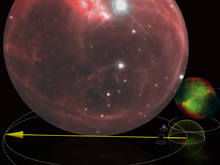 Upper part: Gamma Orionis, Algol B, the Sun (centre), underneath their darker mirror images (artist's interpretation), and other objects, to scale. To help compare different distances this section lists lengths starting at 109 metres (1 gigametre (Gm) or 1 billion metres). 5.0 Gm – (proposed) Size of the arms of the giant triangle shaped Michelson interferometer of the Laser Interferometer Space Antenna (LISA) planned to start observations sometime in the 2030s. Rigel and Aldebaran (top left and right) compared to smaller stars, the Sun (very small dot in lower middle, with orbit of Mercury as yellow ellipse) and transparent sphere with radius of one light minute. To help compare different distances this section lists lengths starting at 1010 metres (10 gigametres (Gm) or 10 million kilometres, or 0.07 Astronomical units). 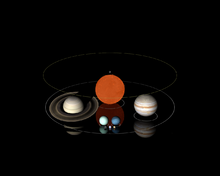 From largest to smallest: Jupiter's orbit, red supergiant star Betelgeuse, Mars' orbit, Earth's orbit, star R Doradus, and orbits of Venus, Mercury. Inside R Doradus' depiction are the blue giant star Rigel and red giant star Aldebaran. The faint yellow glow around the Sun represents one light minute. Click image to see more details and links to their scales. To help compare distances at different orders of magnitude this section lists lengths starting at 1011 metres (100 gigametre|Gm or 100 million kilometres or 0.7 astronomical units). 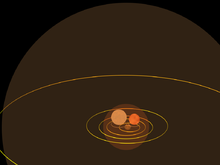 Comparison of size of the Kuiper belt (large faint torus) with the star VY Canis Majoris (within Saturn's orbit), Betelgeuse (inside Jupiter's orbit) and R Doradus (small central red sphere) together with the orbits of Neptune and Uranus, to scale. 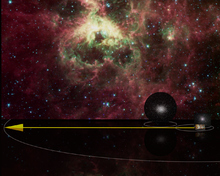 The yellow ellipses represent the orbits of each planet and the dwarf planet Pluto. To help compare different distances, this section lists lengths starting at 1012 m (1 Tm or 1 billion km or 6.7 astronomical units). 1.5 Tm - 10 AU - Estimated diameter of VV Cephei A, a red supergiant. 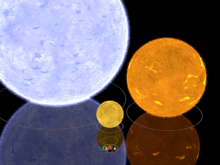 2 Tm – 13.2 AU – Estimated diameter of VY Canis Majoris, one of the largest known stars. 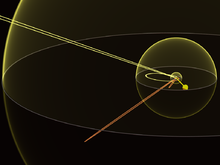 Sedna's orbit (left) is longer than 100 Tm, but other lengths are between 10 and 100 Tm: Comet Hale-Bopp's orbit (lower, faint orange); one light-day (yellow spherical shell with yellow Vernal point arrow as radius); the heliosphere's termination shock (blue shell); and other arrows show positions of Voyager 1 (red) and Pioneer 10 (green). Click on image for larger view and links to other scales. To help compare different distances this section lists lengths starting at 1013 m (10 Tm or 10 billion km or 67 astronomical units). 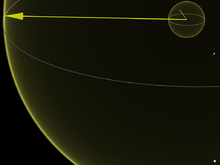 The largest yellow sphere indicates one light month distance from the Sun. Click the image for larger view, more details and links to other scales. To help compare different distances this section lists lengths starting at 1014 m (100 Tm or 100 billion km or 670 astronomical units). Largest circle with yellow arrow indicates one light year from Sun; Cat's Eye Nebula on left and Barnard 68 in middle are depicted in front of Comet 1910 A1's orbit. Click image for larger view, details and links to other scales. To help compare different distances this section lists lengths starting at 1015 m (1 Pm or 1 trillion km or 6685 astronomical units (AU) or 0.11 light years). Objects with size order of magnitude 1e16m: Ten light years (94.6 Pm) radius circle with yellow Vernal Point arrow; Bubble Nebula (NGC 7635), left; Dumbbell Nebula (NGC 6853), right; one light year shell lower right with the smaller Cat's Eye Nebula (NGC_6543) and Barnard 68 adjacent. To help compare different distances this section lists lengths starting at 1016 m (10 Pm or 66,800 AU, 1.06 light years). Lengths with order of magnitude 1e17m: yellow Vernal Point arrow traces hundred light year radius circle with smaller ten light year circle at right; globular cluster Messier 5 in background; 12 light year radius Orion Nebula middle right; 50 light year wide view of the Carina Nebula bottom left; Pleiades cluster and Bubble nebula with similar diameters each around 10 light years bottom right; grey arrows show distances from Sun to stars Aldebaran (65 light years) and Vega (25 light years). To help compare different distances this section lists lengths between 1017 m (100 Pm or 11 light years) and 1018 m (106 light years). 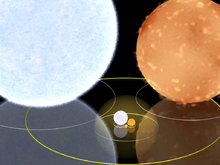 260 Pm – 27 light years – Distance to Chara, a star approximately as bright as our Sun. Its faintness gives us an idea how our Sun would appear when viewed from even so close a distance as this. Lengths with order of magnitude 1e18m: thousand light year radius circle with yellow arrow and 100 light year circle at right with globular cluster Messier 5 within and Carina Nebula in front; globular cluster Omega Centauri to left of both; part of the 1400 light year wide Tarantula Nebula fills the background. This list includes distances between 1 and 10 exametres (1018 m). To help compare different distances this section lists lengths between 1018 m (1 Em or 105.7 light years) and 1019 m (1057 light years). To help compare different orders of magnitude, this section lists distances starting at 10 Em (1019 m or 1,100 light years). To help compare different orders of magnitude, this section lists distances starting at 100 Em (1020 m or 11,000 light years). The zettametre (SI symbol: Zm) is a unit of length in the metric system equal to 1021 metres. To help compare different orders of magnitude, this section lists distances starting at 1 Zm (1021 m or 110,000 light years). <1.9 Zm – <200,000 light years – Revised estimated diameter of the disc of the Milky Way Galaxy. The size was previously thought to be half of this. To help compare different orders of magnitude, this section lists distances starting at 10 Zm (1022 m or 1.1 million light years). To help compare different orders of magnitude, this section lists distances starting at 100 Zm (1023 m or 11 million light years). To help compare different orders of magnitude, this section lists distances starting at 1 Ym (1024 m or 105.702 million light years). To help compare different orders of magnitude, this section lists distances starting at 10 Ym (1025 m or 1.1 billion light-years). At this scale, expansion of the universe becomes significant. Distance of these objects are derived from their measured redshifts, which depends on the cosmological models used. To help compare different orders of magnitude, this section lists distances starting at 100 Ym (1026 m or 11 billion light years). At this scale, expansion of the universe becomes significant. Distance of these objects are derived from their measured redshifts, which depend on the cosmological models used. 886.48 Ym – 93.7 billion light years – The diameter of the observable universe; however, there might be unobserved distances that are even greater. ^ The diameter of human hair ranges from 17 to 181 μm Ley, Brian (1999). Elert, Glenn, ed. 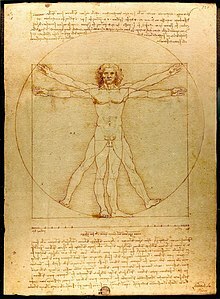 "Diameter of a human hair". The Physics Factbook. Retrieved 2018-12-08. ^ 10115 is 1 followed by 115 zeroes, or a googol multiplied by a quadrillion. 1010115 is 1 followed by a quadrillion googol zeroes. 101010122is 1 followed by 1010122 (a googolplex10 sextillion) zeroes. 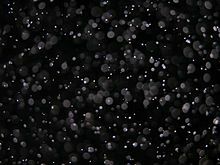 ^ But not cloud or high-level fog droplets; droplet size increases with altitude. For a contradictory study indicating larger drop sizes even in ground fog, see Eldridge, Ralph G. (October 1961). "A Few Fog Drop-Size Distributions". Journal of Meteorology. 18 (5): 671–6. Bibcode:1961JAtS...18..671E. doi:10.1175/1520-0469(1961)018<0671:AFFDSD>2.0.CO;2. ^ a b c d e Cliff Burgess; Fernando Quevedo (November 2007). "The Great Cosmic Roller-Coaster Ride". Scientific American. p. 55. Retrieved 2017-05-01. ^ Abbott, B. P.; et al. (2016). "Observation of Gravitational Waves from a Binary Black Hole Merger". Physical Review Letters. 116 (6): 061102. arXiv:1602.03837. Bibcode:2016PhRvL.116f1102A. doi:10.1103/PhysRevLett.116.061102. PMID 26918975. On 14 September 2015 at 09:50:45 UTC the two detectors of the Laser Interferometer Gravitational-Wave Observatory simultaneously observed a transient gravitational-wave signal. The signal sweeps upwards in frequency from 35 to 250 Hz with a peak gravitational-wave strain of 1.0×10−21. ^ Pohl, R.; et al. (July 2010). "The size of the proton". Nature. 466 (7303): 213–6. Bibcode:2010Natur.466..213P. doi:10.1038/nature09250. PMID 20613837. ^ "CODATA Value: classical electron radius". The NIST Reference on Constants, Units, and Uncertainty. NIST. ^ Mark Winter (2008). "WebElements Periodic Table of the Elements / Sulfur / Radii". Retrieved 2008-12-06. ^ Flahaut E, Bacsa R, Peigney A, Laurent C (June 2003). "Gram-scale CCVD synthesis of double-walled carbon nanotubes". Chemical Communications. 12 (12): 1442–3. doi:10.1039/b301514a. PMID 12841282. ^ Stewart, Robert. "Dr". Radiobiology Software. Archived from the original on 2010-06-30. Retrieved 2015-05-20. ^ F., Adnan. "Samsung announces industry-first mass production of System-on-Chip with 10nm FinFET technology". SamMobile. ^ "Hard drive basics – Capacities, RPM speeds, interfaces, and mechanics". helpwithpcs.com. Retrieved 13 July 2016. ^ Cohn, J. University of California, Berkeley Lyman alpha systems and cosmology. Retrieved 21 February 2009. ^ Seth, S.D. ; Seth, Vimlesh (2009). Textbook of Pharmacology (3rd ed.). Elsevier. p. X111. ISBN 978-81-312-1158-8. Retrieved 19 July 2016. ^ Nave, Carl R (2016). "Color". HyperPhysics. Georgia State University. ^ "Size of bacteria". What are bacteria?. Retrieved 19 July 2016. ^ Ko, Frank K.; Kawabata, Sueo; Inoue, Mari; Niwa, Masako; Fossey, Stephen; Song, John W. "Engineering properties of spider silk" (PDF). web.mit.edu. ^ Doohan, Jim. "Blood cells". biosbcc.net. Archived from the original on 23 July 2016. Retrieved 19 July 2016. ^ a b c d According to The Physics Factbook, the diameter of human hair ranges from 17 to 181 μm Ley, Brian (1999). "Width of a Human Hair". The Physics Factbook. ^ a b Liu Z, Huang AJ, Pflugfelder SC (July 1999). "Evaluation of corneal thickness and topography in normal eyes using the Orbscan corneal topography system". The British Journal of Ophthalmology. 83 (7): 774–8. doi:10.1136/bjo.83.7.774. PMC 1723104. PMID 10381661. ^ a b "Official Rules". MLB. Retrieved 2011-09-30. ^ a b "What is a rapier - Renaissance swords Rapiers". 2-Clicks Swords. ^ a b "Robert Wadlow: Tallest man ever". Guinness World Records. ^ "Animal Records". Smithsonian National Zoological Park. Archived from the original on 23 August 2004. ^ a b "Niagara Falls Geology Facts & Figures". Niagara Parks Commission. Archived from the original on 19 July 2011. Retrieved 29 June 2011. ^ a b "Three Gorges Dam". encyclopedia.com. Cengage Learning. ^ a b Thomas PC, Parker JW, McFadden LA, Russell CT, Stern SA, Sykes MV, Young EF (September 2005). "Differentiation of the asteroid Ceres as revealed by its shape". Nature. 437 (7056): 224–6. Bibcode:2005Natur.437..224T. doi:10.1038/nature03938. PMID 16148926. ^ "Spacecraft escaping the Solar System". Heavens Above. Archived from the original on 7 October 2018. Retrieved 19 October 2018. ^ "Twin Keck telescopes probe dual dust disks". (e) Science News. 24 September 2009. ^ Shiga, David. "Sun's 'twin' an ideal hunting ground for alien life". New Scientist. Retrieved 2007-10-03. ^ Christian, Eric; Samar, Safi-Harb. "How large is the Milky Way?". Retrieved 2008-11-14. ^ Duncan, Martin (2008). "16" (PDF). Physics 216 – Introduction to Astrophysics. Archived from the original (PDF) on 17 December 2008. Retrieved 14 November 2008. ^ "Milky Way fatter than first thought". The Sydney Morning Herald. Australian Associated Press. 20 February 2008. Archived from the original on 28 April 2008. Retrieved 14 November 2008. ^ Mary L. Martialay (March 11, 2015). "The Corrugated Galaxy—Milky Way May Be Much Larger Than Previously Estimated" (Press release). Rensselaer Polytechnic Institute. Archived from the original on March 13, 2015. 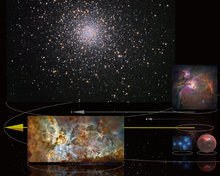 ^ "The Horologium Supercluster". Atlas of the Universe. ^ Gott, J. Richard; Jurić, Mario; Schlegel, David; Hoyle, Fiona; Vogeley, Michael; Tegmark, Max; Bahcall, Neta; Brinkmann, Jon (2005). "A Map of the Universe". The Astrophysical Journal. 624 (2): 463. arXiv:astro-ph/0310571. Bibcode:2005ApJ...624..463G. doi:10.1086/428890. ^ Scott, Douglas; Zibin, J.P. (2006). "How Many Universes Do There Need To Be?". International Journal of Modern Physics D. 15 (12): 2229–2233. arXiv:astro-ph/0605709v2. Bibcode:2006IJMPD..15.2229S. doi:10.1142/S0218271806009662. ^ Tegmark, M. (2003). "Parallel universes. Not just a staple of science fiction, other universes are a direct implication of cosmological observations". Scientific American. 288 (5): 40–51. doi:10.1038/scientificamerican0503-40. PMID 12701329. ^ Tegmark M (May 2003). "Parallel universes. Not just a staple of science fiction, other universes are a direct implication of cosmological observations". Scientific American. 288 (5): 40–51. arXiv:astro-ph/0302131. Bibcode:2003SciAm.288e..40T. doi:10.1038/scientificamerican0503-40. PMID 12701329. ^ Page, Don N.; Allende Prieto, C.; Garzon, F.; Wang, H.; Liu, C.; Deng, L. (2007). "Susskind's challenge to the Hartle Hawking no-boundary proposal and possible resolutions". Journal of Cosmology and Astro-Particle Physics. 2007 (1): 004. arXiv:hep-th/0610199. Bibcode:2007JCAP...01..004P. doi:10.1088/1475-7516/2007/01/004. ^ "The NIST Reference on Constants, Units, and Uncertainty: proton rms charge radius". ^ Stryer, Lubert (1988). Biochemistry. San Francisco: W.H. Freeman. ISBN 978-0-7167-1843-7. ^ "Through the Microscope". www.microbiologytext.com. ^ "Moore's Law Marches on at Intel". Physorg.com. Retrieved 2018-09-01. ^ "Hard drive basics - Capacities, RPM speeds, interfaces and mechanics". www.helpwithpcs.com. ^ Graham T. Smith (2002). Industrial metrology. Springer. p. 253. ISBN 978-1-85233-507-6. ^ Eninger, Robert M.; Hogan, Christopher J.; Biswas, Pratim; Adhikari, Atin; Reponen, Tiina; Grinshpun, Sergey A. (2009). "Electrospray versus Nebulization for Aerosolization and Filter Testing with Bacteriophage Particles". Aerosol Science and Technology. 43 (4): 298–304. Bibcode:2009AerST..43..298E. doi:10.1080/02786820802626355. ^ Seth (18 November 2009). Textbook Of Pharmacology. Elsevier India. ISBN 9788131211588 – via Google Books. ^ Spencer RC (March 2003). "Bacillus anthracis". Journal of Clinical Pathology. 56 (3): 182–7. doi:10.1136/jcp.56.3.182. PMC 1769905. PMID 12610093. ^ Walker K, Skelton H, Smith K (November 2002). "Cutaneous lesions showing giant yeast forms of Blastomyces dermatitidis". Journal of Cutaneous Pathology. 29 (10): 616–8. doi:10.1034/j.1600-0560.2002.291009.x. PMID 12453301. ^ Smith, D.J. (2009). "Human sperm accumulation near surfaces: a simulation study" (PDF). Journal of Fluid Mechanics. 621: 295. Bibcode:2009JFM...621..289S. doi:10.1017/S0022112008004953. Retrieved 20 May 2012. ^ "NAC Audio Cassette Glossary – Cassetro". nactape.com. Retrieved 2018-03-16. ^ "Genes are real things :: DNA from the Beginning". www.dnaftb.org. ^ Wise, R.R. ; Hoober, J.K. (2007). The Structure and Function of Plastids. Springer. p. 14. ISBN 978-1-4020-6570-5. ^ Zak, J. Allen (April 1994). Drop Size Distributions and Related Properties of Fog for Five Locations Measured From Aircraft (PDF) (Report). Hampton, VA: NASA – Langley Research Center. 4585. ^ Gyllenbok, Jan (2018). Encyclopedia of Historical Metrology, Weights, and Measures. Birkhäuser. ISBN 9783319575988. ^ a b "La Loi Du 18 Germinal An 3 - Décision de tracer le mètre, unité fondamentale, sur une règle de platine. Nomenclature des "mesures républicaines". Reprise de la triangulation" (in French). histoire.du.metre.free.fr. Retrieved 2015-10-12. ^ a b Comité International des Poids et Mesures (1935). "Procès-Verbaux des Séances" (in French). 17 (2 ed.). Paris, France: Gauthier-Villars, imprimeur-libraire du Bureau des Longitudes, de l'École Polytechnique: 76. ^ a b Roberts, Richard W. (1975-06-01). Metric System of Weights and Measures - Guidelines for Use. USA: Director of the National Bureau of Standards. Federal Register FR Doc.75-15798 (1975-06-18). Accordingly, the following units and terms listed in the table of metric units in section 2 of the act of 28 July 1866, that legalized the metric system of weights and measures in the United States, are no longer accepted for use in the United States: myriameter, stere, millier or tonneau, quintal, myriagram, kilo (for kilogram). ^ a b Judson, Lewis V. (1976-10-01) . "Appendix 7" (PDF). In Barbrow, Louis E. Weights and Measures Standards of the United States, a brief history. Derived from a prior work by Louis A. Fisher (1905). USA: US Department of Commerce, National Bureau of Standards. p. 33. LCCN 76-600055. NBS Special Publication 447; NIST SP 447; 003-003-01654-3. Retrieved 2015-10-12. ^ Kim Popiolek. "Dr. Charles Lindemann's Lab: Sperm Facts". Oakland University. ^ Santoso, Alex (17 June 2006). "World's Biggest Sperm Belongs to a Tiny Fly". Neatorama. ^ "CNN - Scientists discover biggest bacteria ever - April 15, 1999". www.cnn.com. Retrieved 2017-05-20. ^ "World's Smallest Frog Found—Fly-Size Beast Is Tiniest Vertebrate". 2017-01-13. Retrieved 2017-05-20. ^ "World's smallest vertebrate has a big secret". New Scientist. Retrieved 2017-05-20. ^ Lindstrom, Hannah. "The Smallest Salamander". Mongabay.com. Retrieved 2017-05-20. ^ "Comparing quail eggs". BackYard Chickens. Retrieved 2017-05-20. ^ "USGA: Guide to the Rules on Clubs and Balls". USGA. Retrieved 2011-09-30. ^ "Credit Card Dimensions". Dimensions Info. 11 January 2014. ^ Bohun B. Kinloch, Jr. & William H. Scheuner. "Pinus lambertiana". Archived from the original on 8 June 2011. Retrieved 2017-05-01. ^ "HTwins.net - The Scale of the Universe". htwins.net. Retrieved 2017-05-20. ^ Plait, P. (2008-10-06). "Incoming!!!". Bad Astronomy. Archived from the original on 7 October 2008. Retrieved 2008-10-08. ^ "Rule 1.04 The Playing Field" (PDF). Official Baseball Rules. Major League Baseball. 25 January 2010. pp. 1–5. Archived (PDF) from the original on 27 April 2011. Retrieved 1 April 2011. See especially Diagram No. 1, page 3. ^ "Law 7 (The pitch)". Laws of Cricket. Marylebone Cricket Club. October 2010. Archived from the original on 14 May 2011. Retrieved 1 April 2011. ^ "Animal Records". Smithsonian National Zoological Park. Archived from the original on 25 April 2009. Retrieved 29 May 2007. ^ Highways Agency. "Driver Location Signs - Frequently Asked Questions". Archived from the original on 10 August 2012. Retrieved 10 February 2010. ^ "Kingda Ka (Six Flags Great Adventure)". Archived from the original on 25 April 2009. Retrieved 18 April 2009. ^ "Tour Eiffel". Archived from the original on 16 December 1996. Retrieved 15 September 2010. ^ Campbell, Marilyn (17 February 2018). "How Tall is the CN Tower?". TripSavvy. Retrieved 2017-05-20. ^ "Burj Dubai all set for 09/09/09 soft opening". Emirates Business 24-7. Archived from the original on 19 January 2009. Retrieved 17 January 2009. ^ "Tallest tree in the world: coast redwood". Monumental Trees, an inventory of big and old trees worldwide. ^ Fujiwara A, Kawaguchi J, Yeomans DK, Abe M, Mukai T, Okada T, Saito J, Yano H, Yoshikawa M, Scheeres DJ, Barnouin-Jha O, Cheng AF, Demura H, Gaskell RW, Hirata N, Ikeda H, Kominato T, Miyamoto H, Nakamura AM, Nakamura R, Sasaki S, Uesugi K (June 2006). "The rubble-pile asteroid Itokawa as observed by Hayabusa". Science. 312 (5778): 1330–4. Bibcode:2006Sci...312.1330F. doi:10.1126/science.1125841. PMID 16741107. ^ "Golden Gate Bridge official website". Retrieved 10 June 2012. ^ "Nautical mile". Merriam-Webster Dictionary. Retrieved 12 March 2011. ^ "Kosciuszko National Park lookouts and scenery". Office of Environment & Heritage: NSW National Parks & Wildlife Service. ^ "Carstensz Pyramid details". Carstensz Pyramid Site. Archived from the original on 16 December 2014. ^ "What is a farsakh or farsang?". sizes.com. ^ "IAAF Competition Rules 2008" (PDF). IAAF. p. 195. Archived (PDF) from the original on 25 April 2009. Retrieved 20 April 2009. ^ Wise, Jeff (1 October 2009). "Turkey Building the World's Deepest Immersed Tube Tunnel". Popular Mechanics. Retrieved 1 May 2017. ^ "Facts and History about the Panama Canal". ^ Plescia, Jeff (1 October 1997). "Height of Martian vs. Earth mountains". Questions and Answers about Mars terrain and geology. Archived from the original on 14 October 2008. Retrieved 20 April 2009. ^ "High Speed 1 Project Hoem". www.betchel.com. Betchel Corporation. Retrieved 8 February 2015. ^ "Bordeaux-Paris | the event". www.bordeauxparis.com. Archived from the original on 28 March 2017. Retrieved 30 April 2017. ^ Downward, R.J.; Bromell, J.E. (March 1990). "The development of a policy for the management of dingo populations in South Australia". Proceedings of the Fourteenth Vertebrate Pest Conference 1990. University of Nebraska - Lincoln. Archived from the original on 4 September 2009. Retrieved 2009-08-31. 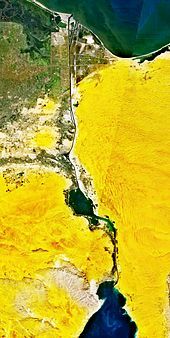 ^ "China's Great Wall far longer than thought: survey". AFP. 2009-04-20. Archived from the original on 27 April 2009. Retrieved 2009-04-20. ^ CIS railway timetable, route No. 002, Moscow-Vladivostok. Archived 2009-12-03. ^ CIS railway timetable, route No. 350, Kiev-Vladivostok. Archived 2009-12-03. ^ McGourty, Christine (2005-12-14). "Hubble finds mass of white dwarf". BBC News. Retrieved 2007-10-13. ^ NASA Staff (10 May 2011). "Solar System Exploration - Earth's Moon: Facts & Figures". NASA. Archived from the original on 7 November 2011. Retrieved 6 November 2011. ^ "Sun Fact Sheet". nssdc.gsfc.nasa.gov. ^ Moravveji, Ehsan; Guinan, Edward F; Shultz, Matt; Williamson, Michael H; Moya, Andres (4 January 2012). "Asteroseismology of the Nearby SN-II Progenitor: Rigel Part I. The MOST High Precision Photometry and Radial Velocity Monitoring". Astrophysical Journal. 747 (2): 2. arXiv:1201.0843. Bibcode:2012ApJ...747..108M. doi:10.1088/0004-637X/747/2/108. 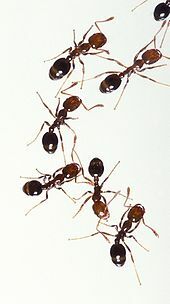 ^ Richichi, A.; Roccatagliata, V.; Shultz, Matt; Williamson, Michael H.; Moya, Andres (2005). "Aldebaran's angular diameter: How well do we know it?". Astronomy & Astrophysics. 433 (1): 305–312. arXiv:astro-ph/0502181. Bibcode:2005A&A...433..305R. doi:10.1051/0004-6361:20041765. They derived an angular diameter of 20.58±0.03 milliarcsec, which given a distance of 65 light years yields a diameter of 61 million km. ^ Chesneau, O.; Meilland, A.; Chapellier, E.; Millour, F.; Van Genderen, A. M.; Nazé, Y.; Smith, N.; Spang, A.; Smoker, J. V.; Dessart, L.; Kanaan, S.; Bendjoya, Ph. ; Feast, M. W.; Groh, J. H.; Lobel, A.; Nardetto, N.; Otero, S.; Oudmaijer, R. D.; Tekola, A. G.; Whitelock, P. A.; Arcos, C.; Curé, M.; Vanzi, L. (2014). "The yellow hypergiant HR 5171 A: Resolving a massive interacting binary in the common envelope phase". Astronomy & Astrophysics. 563: A71. arXiv:1401.2628v2. Bibcode:2014A&A...563A..71C. doi:10.1051/0004-6361/201322421. ^ Wittkowski, M; Abellan, F. J; Arroyo-Torres, B; Chiavassa, A; Guirado, J. C; Marcaide, J. M; Alberdi, A; De Wit, W. J; Hofmann, K.-H; Meilland, A; Millour, F; Mohamed, S; Sanchez-Bermudez, J (28 September 2017). "Multi-epoch VLTI-PIONIER imaging of the supergiant V766 Cen: Image of the close companion in front of the primary". Astronomy & Astrophysics. 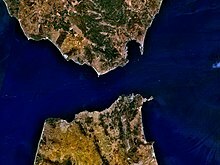 1709: L1. arXiv:1709.09430. Bibcode:2017A&A...606L...1W. doi:10.1051/0004-6361/201731569. ^ Bauer, W. H.; Gull, T. R.; Bennett, P. D. (2008). "Spatial Extension in the Ultraviolet Spectrum of Vv Cephei". The Astronomical Journal. 136 (3): 1312. Bibcode:2008AJ....136.1312H. doi:10.1088/0004-6256/136/3/1312. ^ a b Wittkowski, M.; Hauschildt, P.H. ; Arroyo-Torres, B.; Marcaide, J.M. (5 April 2012). "Fundamental properties and atmospheric structure of the red supergiant VY CMa based on VLTI/AMBER spectro-interferometry". Astronomy & Astrophysics. 540: L12. arXiv:1203.5194. Bibcode:2012A&A...540L..12W. doi:10.1051/0004-6361/201219126. ^ Monnier, J. D; Millan-Gabet, R; Tuthill, P. G; Traub, W. A; Carleton, N. P; Coudé Du Foresto, V; Danchi, W. C; Lacasse, M. G; Morel, S; Perrin, G; Porro, I. L; Schloerb, F. P; Townes, C. H (2004). "High-Resolution Imaging of Dust Shells by Using Keck Aperture Masking and the IOTA Interferometer". The Astrophysical Journal. 605 (1): 436–461. arXiv:astro-ph/0401363. Bibcode:2004ApJ...605..436M. doi:10.1086/382218. ^ "Comet Hyakutake: Orbital elements and 10-day ephemeris". European Space Agency. Retrieved 2008-12-07. ^ Parthasarathy, M. (2000). "Birth and early evolution of planetary nebulae". Bulletin of the Astronomical Society of India. 28: 217–224. Bibcode:2000BASI...28..217P. −21 parsecs to the Orion Nebula Cluster from Very Long Baseline Array Observations". The Astrophysical Journal. 667 (2): 1161–1169. arXiv:0706.2361. Bibcode:2007ApJ...667.1161S. doi:10.1086/520922. ^ distance × sin( diameter_angle ), using distance of 5kpc (15.8 ± 1.1 kly) and angle 36.3', = 172 ± 12.5 ly. ^ Harper, Graham M.; Brown, Alexander; Guinan, Edward F. (April 2008). "A New VLA-Hipparcos Distance to Betelgeuse and its Implications" (PDF). The Astronomical Journal. 135 (4): 1430–40. Bibcode:2008AJ....135.1430H. doi:10.1088/0004-6256/135/4/1430. ^ Harris, Hugh C.; Dahn, Conard C.; Canzian, Blaise; Guetter, Harry H.; et al. (2007). "Trigonometric Parallaxes of Central Stars of Planetary Nebulae". The Astronomical Journal. 133 (2): 631–638. arXiv:astro-ph/0611543. Bibcode:2007AJ....133..631H. doi:10.1086/510348. ^ Reid, M. J.; et al. (2009). "Trigonometric Parallaxes of Massive Star Forming Regions: VI. Galactic Structure, Fundamental Parameters and Non-Circular Motions". Astrophysical Journal. 700 (1): 137–148. arXiv:0902.3913. Bibcode:2009ApJ...700..137R. doi:10.1088/0004-637X/700/1/137. ^ a b "SI Brochure: The International System of Units (SI)". International Committee for Weights and Measures. Organisation Intergouvernementale de la Convention du Mètre. Retrieved 11 October 2014.